Aries and Aquarius make an exciting and friendly pair, giving each other a lot of space and enjoying their personal freedom as well. Zodiac Signs that are two apart tend to have a special connection and these are no exception. They are great friends as they communicate really well. Optimism, mutual respect and appreciation, flows in the relationship. The relationship can be very exciting, adventurous and interesting. They will enjoy each other’s company as both of them love spontaneous fun and freedom. 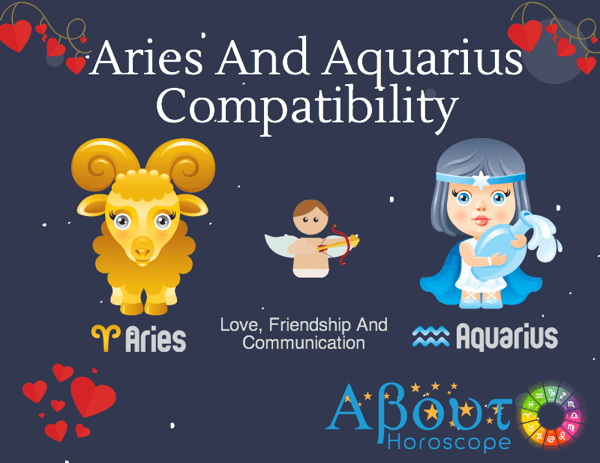 Aries and Aquarius are two of the most suitable signs that have a pretty decent degree of compatibility because they both share similar attributes of independence, thrill, and a deep level of love for freedom. When these two are together then can easily solve any type of problems through their use of mutual discussion. Although they share the same personality traits Aquarians need more space than Arians which may create a tiff between them. Aries is a Fire Sign and Aquarius is an Air Sign. Air fuels Fire and helps it spread; similarly, Aquarius can help Aries think up new schemes and then realize them. Aquarius stimulates Aries intellectually, something that most of the other Signs fail to do. Both Signs have wide-ranging interests, so mentally active Aquarius is sure to provide physically active Aries with plenty of support to new adventures and causes. Many Aries-Aquarius relationships are based on mutual admiration. Aries loves how unique Aquarius is, their inventive vision of the world; Aquarius loves Aries for their energy and initiative — Aquarius gets new ideas all the time but sometimes finds it hard to carry them out.An Aquarian will always support the spontaneity of an Arian and in turn the Arian will also admire the creativity and innovative ideas of an Aquarian. Aries is one of the easiest signs to understand, these are action people, extroverted and assertive. They want to be in charge, the boss, the hunter, the initiator. They are typically confident, fiery, bold, spontaneous and independent. A bundle of energy and dynamism; kind of like a Pied Piper leading colleagues, friends or family along with his charm and charisma. The Aquarius woman is smart, independent and friendly. She is strong enough to conquer even the most difficult of tasks. She is frank and has strong beliefs but is also open-minded and tolerant of others viewpoint. Famous for her affectionate nature, it is not difficult for her to make friends. She is popular in social circles. But she takes time to build an intimate relationship as she shies away from emotional commitment. She is truthful, independent and compassionate. Aries man is very romantic by nature and will keep the Aquarius woman interested. An Aries man and an Aquarius woman will greatly enjoy the physical relationship with each other. Both of them also like to socialize with friends and relatives. But sometimes Aries man requires privacy and does not like interference. Aquarius woman is attracted to the originality and spontaneity of Aries man. An Aquarius woman sets the bar really high, and Aries man who delights on taking on a challenge will never back down until he wins the Aquarian’s heart. The Aries woman exudes the definitive Aries personality: naturally confident, fiery, bold, spontaneous and independent. Thus, an Aries woman will not typically take “No” for an answer. She is very fun loving and energetic. An Aquarius man with his enormous sense of adventure and unconventional ways can easily mesmerize an Aries woman. With a number of qualities, an Aquarius man will find a dynamic life ahead. Aquarius man is enthusiastic, witty, affectionate and social. But he doesn’t get emotionally close to people easily. He will maintain some distance initially but when trust is earned, he will be a loyal friend or partner for life. Aquarius man is not always punctual and obedient. He loves his freedom and believes in giving freedom to his woman. When in love Aquarius man is communicative, imaginative, witty, candid and friendly. Aries will love spending time with Aquarius who will always come up with great ideas to have a good time. They are both faithful, especially when they have found their soul-mates. Both are supportive of independent partners because they themselves guard their independence fiercely. Aries and Aquarius are very compatible. Relationship is harmonious and even in bitter disagreement these two will put things on hold to work things out. Aquarius instinctively knows how to handle an Aries and their impulsive behaviors. Due to their highly motivated and passionate endeavors, they find great successes through accomplishments and career. Aries is a mixture of a fearless warrior and undisciplined child, being the naïve risk taker Aries needs Aquarius to keep him/her on the right path. There is great potential here for a long lasting harmonious relationship. Though they are generally compatible they still have to face some minor glitches. Aries maybe too impulsive for the free flowing soul of Aquarian making them feel uncomfortable sometimes. Aquarians’ unpredictability can be good or bad to any relationship. Oftentimes, it is a wonderful trait which always keeps a relationship fresh and new. Sometimes though, it can be frustrating and seems insincere to the straight-forward lover, Aries. This can crush the heart of Aries and make them feel confused and empty. Aries’ aggressive nature and Aquarian’s need for space can create some undefined distances between these two. But by learning together how to modify their weaknesses, Aries and Aquarius can have a wonderful journey of life ahead of them that never grows old and is enriched with exciting adventures and experiences. What’s the best aspect of the Aries-Aquarius relationship? Their ability to achieve so much when they work together. If one thing is for sure, these two never run in place for too long. Instead, they are the force that inspires others to live a full life. They live a full life, achieving many things together. The Aries and Aquarius can do well with one another.